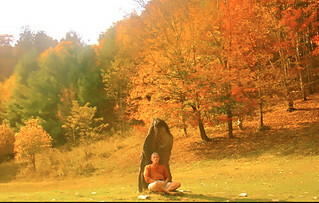 Ancient wisdoms use sight, sounds and actions to get and stay in harmony with our natural being. 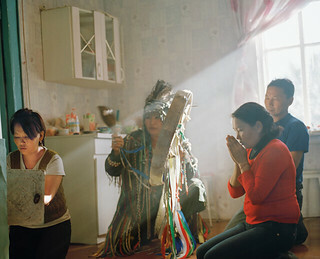 National Geographic photo by of the Tuvan in prayer from the article “Vanishing Languages”. What do Tuva, India and Ecuador have in common? Could there have been a Tuvindidor? See how ancient wisdoms use similar exercises for balance. The July 2012 National Geographic article “Vanishing Languages” by Russ Rymer with photography by Lynn Johnson tells how a language dies every 14 days and explains that by the next century nearly half of the roughly 7,000 languages spoken on Earth will likely disappear, as communities abandon native tongues in favor of English, Mandarin, or Spanish. We can spot common threads that run through all ancient wisdoms. Take action as an example. 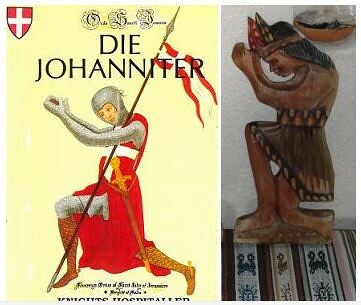 These are a thousand year old symbol of the Knights Hospitaler (left) and an ancient Incan figurine showing a prayer position and exercise. This is the second in a series on ancient wisdoms and how we can incorporate them for better lifestyles in the modern world. See ancient wisdoms #1 here. The importance of words in ancient languages and the connection between the frequencies we call sound and intelligence can turn our lifestyles up a notch or ten. Ancient wisdoms can help tune us into reality because they all, at some level, reflect the same truths about the basics of everything in our physical world. One way we can see this is through their commonality of sounds… how the ancients… though separated by vast distances use similar sounds to be aligned with nature’s truth. For example at the language level, the root of Quichua in the Andes and Sanskrit in India are the same. Many words and sounds are identical. 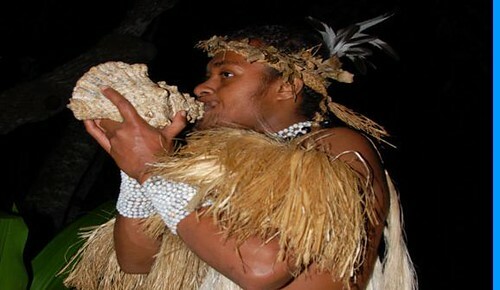 Another example is the use of conch shell trumpets in so many ceremonies of ancient wisdom. One way of looking at everything is as a collage of frequencies. Good health is the body operating as a bundle of correct, natural frequencies. Healers from the ancient disciplines globally use the frequency emitted from the conch shell because the form of these shells represent the Golden Mean. Hearing the Golden Mean in music or sound helps balance our being. Shamans in Ecuador begin ceremonies with the blowing of the conch because they know that the conch represents the Golden Mean, 1 to 1.6. the expression of nature… the rate at which nature expands. Hearing this frequency helps integrate the brain, body mind and soul. In India the conch shell is an important ritual object in Hinduism. The shell is used as a ceremonial trumpet, as part of religious practices, for example puja. We can become smarter and more productive by dwelling upon and truly understanding the words used in ancient wisdoms. See the conch used in Indian Puja. 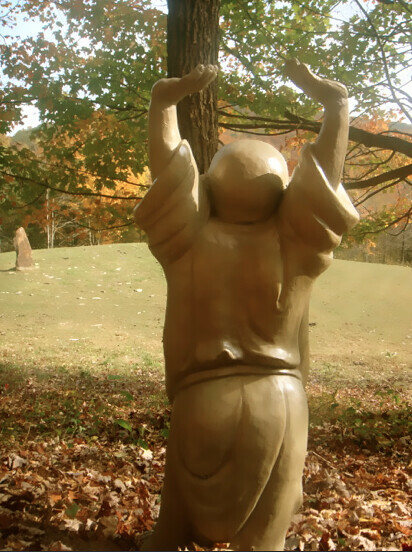 Ancient wisdoms also use words and chants to establish natural balance. For example a series of chants I was taught from the archives of an ancient prophesy were aimed at dwelling on words that reflected the spirit of friendliness, happiness and compassion. As social animals in a crowded interconnected world there are few things we can do that will improve our lives more than being friendly, compassionate and happy to get others to cooperate with us and enjoy a better lifestyle. Cooperation is a basis for survival and enrichment and there are few personal qualities more effective at gaining cooperation than friendliness, happiness and compassion. The words in ancient levels can often express wisdoms at an even deeper level in reaching the full spirit of such concept as friendliness, happiness and compassion. The National Geographic article for example reflects a clue into this deeper wisdom when it explains the Tuvan word “khoj özeeri”. An excerpt from this National Geographic article explains “khoj özeeri”: One morning in early fall Andrei Mongush and his parents began preparations for supper, selecting a black-faced, fat-tailed sheep from their flock and rolling it onto its back on a tarp outside their livestock paddock. The Mongush family’s home is on the Siberian taiga, at the edge of the endless steppes, just over the horizon from Kyzyl, the capital of the Republic of Tuva, in the Russian Federation. Khoj özeeri, is the Tuvan method of killing a sheep. If slaughtering livestock can be seen as part of humans’ closeness to animals, khoj özeeri represents an unusually intimate version. The article also says: Reaching through an incision in the sheep’s hide, the slaughterer severs a vital artery with his fingers, allowing the animal to quickly slip away without alarm, so peacefully that one must check its eyes to see if it is dead. In the language of the Tuvan people, khoj özeeri means not only slaughter but also kindness, humaneness, a ceremony by which a family can kill, skin, and butcher a sheep, salting its hide and preparing its meat and making sausage with the saved blood and cleansed entrails so neatly that the whole thing can be accomplished in two hours (as the Mongushes did this morning) in one’s good clothes without spilling a drop of blood. The Tuvan have carried this energy described in these sounds… friendliness, happiness and compassion… so far into their lifestyles that it turns the act of slaughter into a ceremony of kindness. These are universal concepts that ancient wisdoms everywhere express so we can learn a lot by looking for ideas and concepts that ancient wisdoms share in common. Merri and I observed this kind of universal cooperation in the chants and consequently mentality of the advanced Andean shamans… that everything… “even the worms in the earth” the shaman used to say is part of a universal cooperation. When they plant their crops… they plant an area for themselves and a portion for the wild animals to eat because they are a part and parcel of our total being. The sounds, the singing… the combination of the beats, rhythms, tones and words create a powerful useful meaning in the chants. This is why we use music and rhythm in all our Super Thinking courses and seminars now. 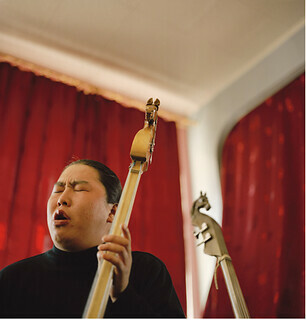 Another quote from the National Geographic article explains the deep power within music: When I ask university students in Kyzyl what Tuvan words are untranslatable into English or Russian, they suggest khöömei, because the singing is so connected with the Tuvan environment that only a native can understand it. The article tells about Andrei Mongush and his wife says: They work as musicians in the Tuvan National Orchestra, an ensemble that uses traditional Tuvan instruments and melodies in symphonic arrangements. Andrei is a master of the most characteristic Tuvan music form: throat singing, or khöömei. khei-àt means air horse or a spiritual place within. Ai-Xaan Oorzhak throat sings and plays the igil, or horse-head fiddle, with bow techniques like “make horse walk.” Singers use the term “air horse” to describe the spiritual depths they draw from to produce the harmonic sounds. We can see how alike chants and songs from varied cultures are by listening to a Tuvan singer and then an Indian Vedic chant. Hear Tuvan throat singing here. The sad answer is that mankind loses a unique window into reality and a special way to state truth and we lose words that can lead us to truth. Fortunately we can improve our lifestyles by gaining greater unison with positive truths when we look for agreements in the ancient wisdoms that we can apply to our daily activities in the modern world. The National Geographic article also provided a clue about how to learn a language when it said: Andrei and his wife also speak English, which they are teaching themselves with pieces of paper labeled in English pasted onto seemingly every object in their modern kitchen in Kyzyl. The key to speaking a language well is to use it and use it and use it. This is why our Super Thinking + Spanish courses use music to help the process of absorbing, retaining and recalling the language… plus create a mental bubble that keeps delegates think Spanish so they learn it even when they do not speak it. Learn how to combine the power of music and 4005 Spanish words you already know as you learn Super Spanish. We have added a 3 Day Super Thinking + Spanish Camp to be conducted September 21, 22 and 23 at our North Carolina farm on Little Horse Creek. 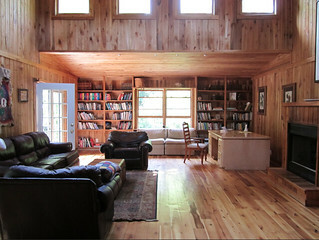 In these busy times the farm is a peaceful quiet place to learn. Here is Little Horse Creek. 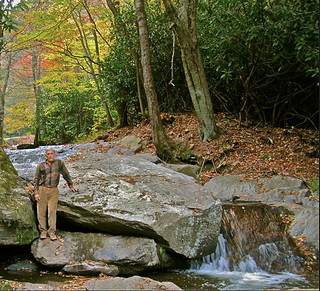 The creek starts on our land… fed by dozens of pure water springs. 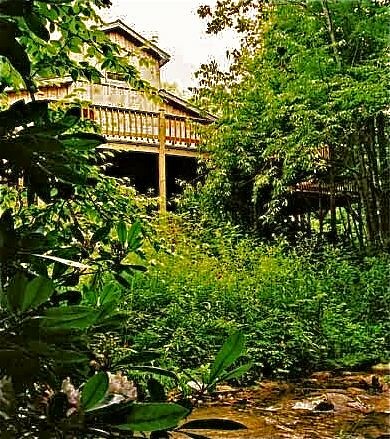 It feeds the pond below our main house where guests meet and flows past our deep woods seminar hall where we learn together. Creek below the seminar hall. 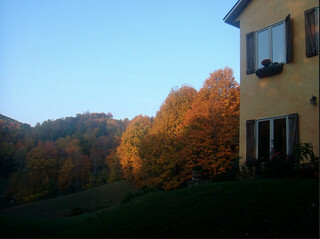 The leaf change will have begun…(Saturday, Sept. 22 is the first day of Fall)…enjoy the beauty of golden leaves. 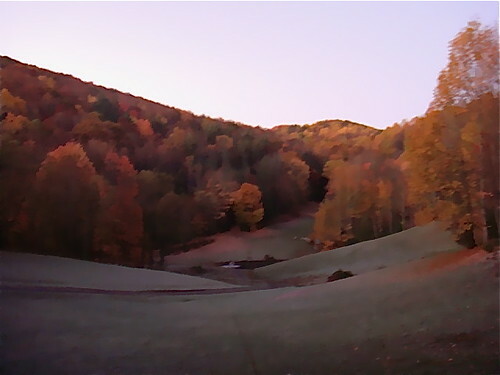 and crisp mountain morns… maybe even a little frost. take a little relaxation in the sun… since we use relaxation techniques in the teaching of Spanish. come up to our house for afternoon tea. The Super Thinking + Spanish course is the same as always but seriously limited to the number of delegates due to the nature of our seminar hall. Here is the inside of our seminar hall. 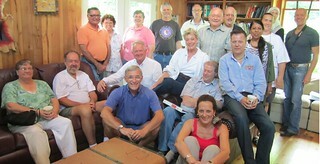 A recent group at the camp. 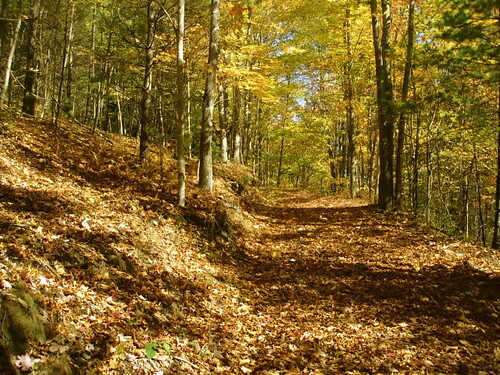 We hope you join us for this Blue Ridge experience where you’ll enjoy nature and learn Super Thinking + Spanish. Or if you prefer the Amazon! 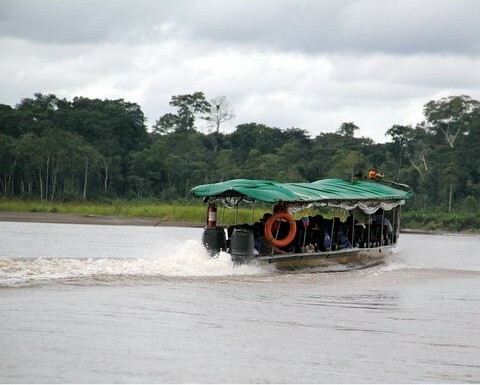 October 8 to 12 Glenn Sterling with conduct a Super Thinking + Spanish course in the Amazon. Glenn Sterling sent us this report about the first Amazon Spanish Camp he organized and conducted. Here is a picture of lodge from the canoe on the lake. One great way to get paid to travel to places you desire is as a Super Thinking + Spanish teacher. Spiro Michas enjoyed conducting a Super Spanish course when he visited Uruguay. 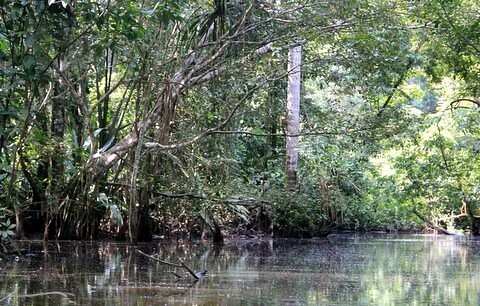 Glenn Sterling always wanted to visit the Amazon so he organized course there. Learn how to become a Super Thinking + Spanish teacher during our September Blue Ridge Spanish Camp. See below the schedule for Glenn’s next Amazon Spanish camp. 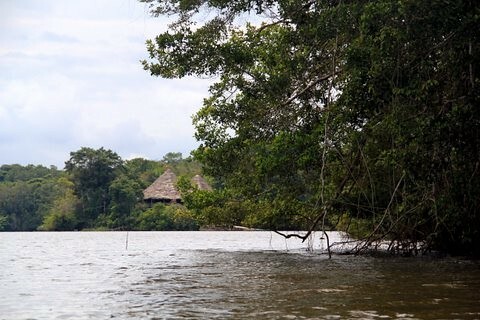 Here is a report from Glenn on the first Amazon Spanish Camp he conducted. Arriving was 99% of the adventure. We’d flown from Quito, Ecuador. Quito at night taken from Stubel Suites and Cafe. We flew next morning for a half hour flight to Coca (named after a local Indian Community ) a city of about 60,000. 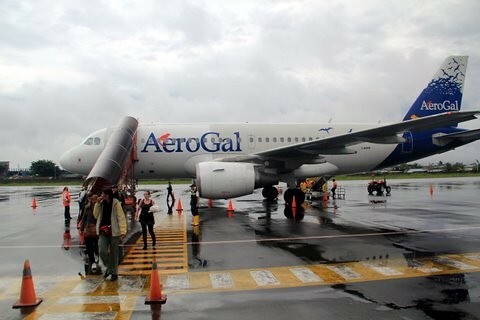 This was our Aerogal flight to Coca. This bus was waiting for us at the Coca Airport. 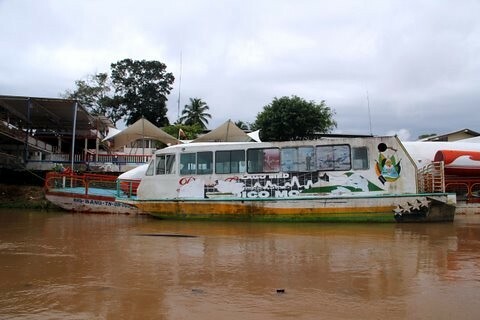 The bus took us to Coca and once there we loaded onto a boat and donned life jackets. 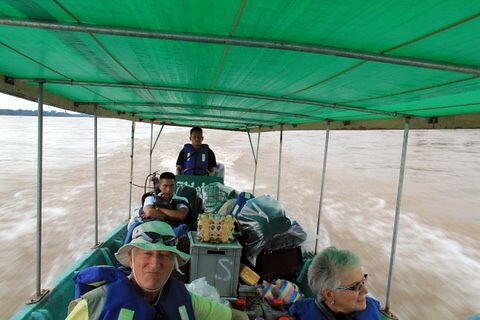 Our seatbacks were slid into place and we began the 2.5 hour journey down the broad, shallow, silt-laden Napo River. 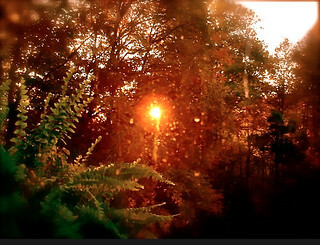 The weather is never chilly here but is frequently blessed with warmish showers. Our ride was no exception, so we were wet but warm and our rears comforted by the deep foam seat bottoms. 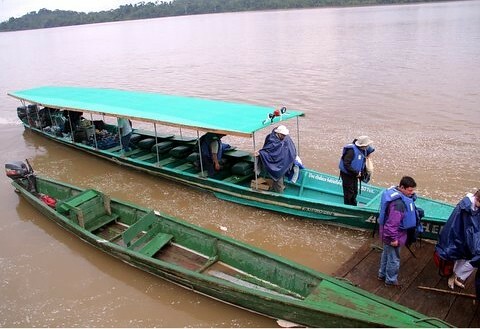 There were lots of odd boats on the Napo, a tributary of the Amazon River. One had been a jet! 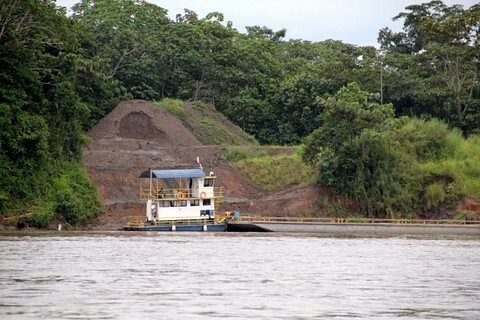 In the Amazon, the river IS the highway. Our guide, leader and naturalist, Rodrigo, showed us how to open a unique local fruit we’d found in our yummy, bagged lunches. Bottled water accompanied our snack. We sped downriver dodging islands of debris, tree stumps, clumps of floating grass and other items. 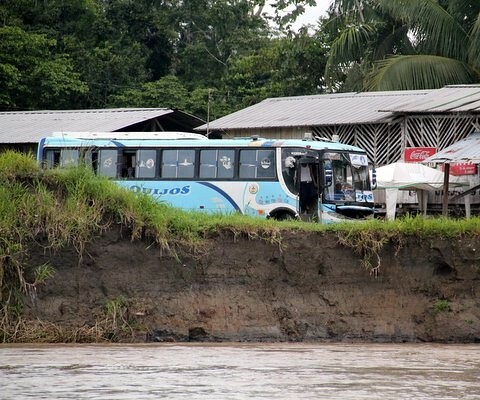 The river was widening as its banks collapsed from swollen waters and frequent rains. Daunesh said “Hey, it’s a rain forest.” It was. 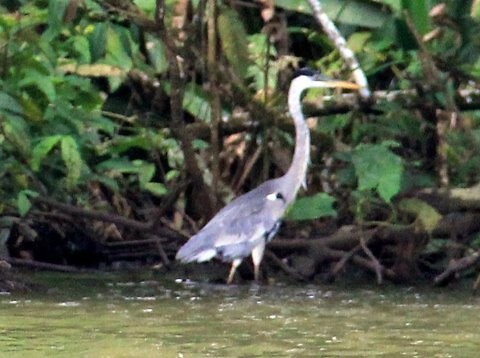 We were never alone on the river. The ponchos kept us dry. 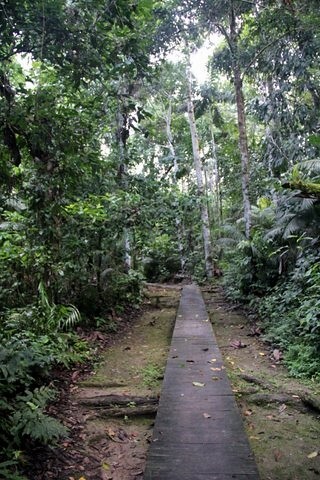 Finally we felt alone in the jungle when we were led to a 15 minute walk down a boardwalk trail into the Amazon jungle. Daunesh was among the first to arrive at our canoes and soon our Armada struck off through a narrow waterway. The water way led to the open waters of Lake Garcocha (Heron lake in Quicha). In another 10 minutes we arrived at the lodge on the edge of the lake. 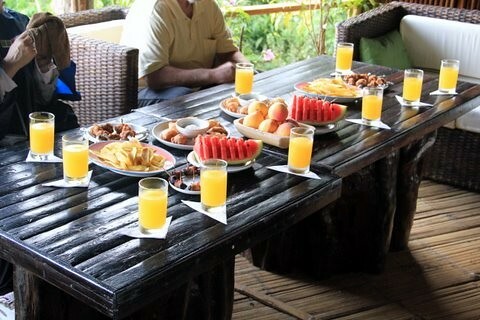 They had refreshing drinks and mouth watering snacks awaiting us and after the travel adventure our appetites were ready. Learn how to create your own seminar or tour business.